When we first moved to Tasmania over 20 years ago, Liawenee almost always got a mention on the news during the weather report and used to give us a good chuckle for two reasons – it’s amongst the coldest inhabited places in Australia and the name sounds downright funny. Even funnier is the fact that the name is derived from the Aboriginal name for frigid. 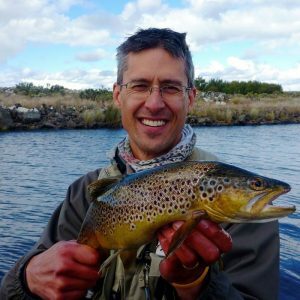 Once a year the trout spawn here and an open weekend where people who are into all things trouty head up to see the Inland Fisheries demonstrate how the fish are trapped and stripped of eggs which will then be hatched to populate waters around the state. 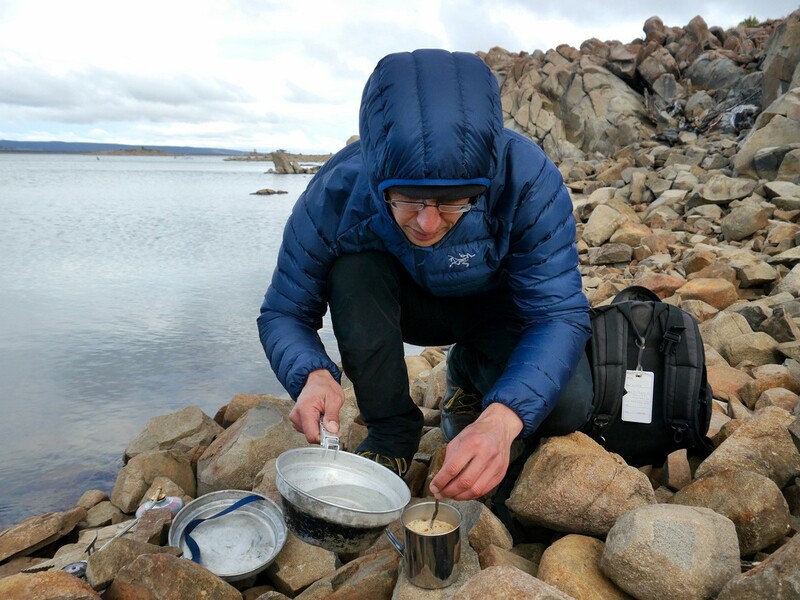 In other words for this fly fisher, it’s the perfect excuse to test out the Cerium LT Hoody Down Jacket from Arc’Teryx which last year ranked equal first in Gear Lab’s testing of eight top down jackets. Currently, I use a down vest when out hiking for the end of the day and sometimes to sleep in (especially if sleeping in the snow). I never wear down when active because I run pretty hot, but it comes to the fore when not moving much. When I dump my pack the polar fleece and vest come out almost straight away. I find vests handy because I can layer under it, and still be able to slip on a shell if it gets wet. Down is almost mandatory for me because of the weight advantage for the insulation gained and it packs down to a low volume saving vital pack space (although I never store down compressed). The following review was performed in 7 degrees Celsius and 32km/h WSW winds, according to Liawenee’s (chuckle) weather station which gave a “feels like” temp of -0.6 deg C according to the Bureau of Meteorology. The Cerium LT Hoody utilises Arato 10 nylon which is Arc’Teryx’s DWR lightweight durable nylon fabric that I’m assuming is 10 denier. Early down jackets weren’t moisture resistant so even a light drizzle killed the insulative capability so the move to some water resistance is welcomed although this isn’t permanent but should give you 5-7 years depending on how tough you are on gear. Having said that, it isn’t hard to re-spray the fabric with DWR. With respect to durability, the jacket has more sewn through baffles than your average urban wear down jacket and this stops down from moving about and helps it remain in place. The Cerium LT Hoody boasts down of 850 Fill Power just shy of the maximum commonly available which is 900. Going to 900 would be another weight saving but presumably, this would bump up the cost and the jacket is already on the high side. Arc’Teryx states that 102g of European white goose down is used in this men’s size Medium jacket. It isn’t immediately obvious that the down is certifiable and ethical but there is a global push from consumers to pressure manufacturers away from using down from force-fed birds and birds plucked live. Unfortunately, the down used is non-hydrophobic down which is now becoming more common and does a really good job of retaining insulative properties even when wet. An interesting feature of this down jacket is that it’s not all down. 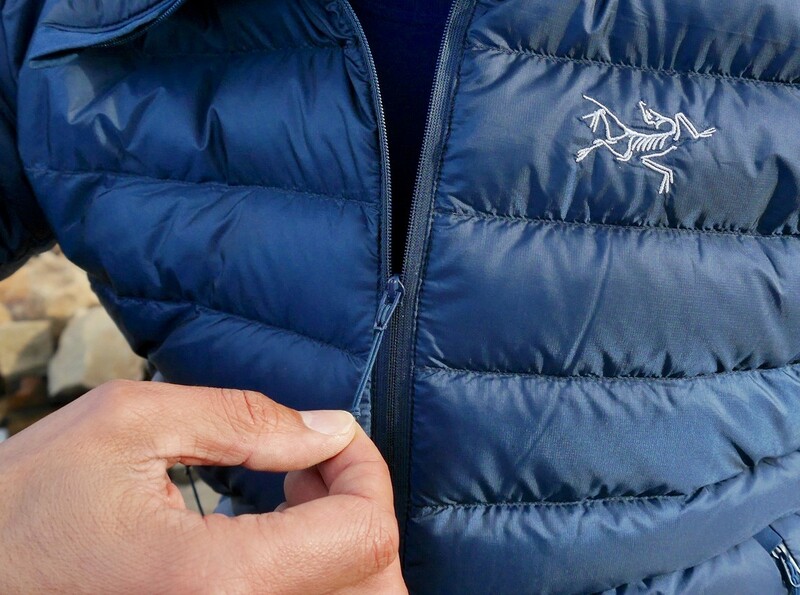 A closer look reveals that Arc’Teryx have used Coreloft synthetic insulation (100 gsm and 80 gsm) in strategic locations on the jacket that are susceptible to moisture. On the surface, this looks like a little bit of cheating but makes total sense. Any down that gets moist is simply not going to work as well so using what Arc’Teryx calls “Down Composite Mapping” they have cleverly placed down (core and shoulders) and synthetic Coreloft (hood, collar, hemlines and cuffs) around the jacket where required. The Cerium LT Hoody comes with elasticated cuffs on the arms to prevent drafts and an elasticated draw cord hem line and hoody with the ability to adjust the draw cords with elegant friction based clips. Rounding out the features, two external zippered hand-warmer pockets and one internal pocket containing a stuff sack with a clever loop to loop connector so it can be removed if desired. The jackets come in seven different colours and five sizes from small to XXL. I tested a Medium in Nocturne colour which is a fancy name for navy. For my 188cm slender frame, it just fit. Just. I could have done with a couple of extra centimetres of sleeve and possibly a couple on the hem as well but I’d rather the trim fit around the torso because warmth is all about stabilising warm air around the body. Note Arc’Teryx denote the fit of this garment to be “Trim” which means it’s a slimmer cut than Relaxed and slimmer still than Regular which really suits my 82cm waist. My Cerium LT is super comfortable to wear. At 310g for the men’s M model (275g for the women’s) you barely feel like it’s there. The nylon outer is really soft to touch. So how did it perform? As I drove to Liawenee I realised I had intended to bring a fleece vest so I had some options and metaphorically kicked myself because apart from the jacket all I had was a base layer, in the form of a Macpac light polypropylene long-sleeved top. I was really going to have to rely on the Cerium LT Hoody. I was not disappointed. Wandering around the various displays of native fish, lobsters, trout and fishing merch (I tried not to look at the merch) in the upwards of 30km/h breeze running through those wild windswept high country plains I was really comfortable. The wind resistance and insulation were spot on. The only place I would have liked a little extra warmth was my neck but usually, I carry a neck gaiter (I left it in the other car). I decided to test it even further, so on the way home after inspecting one of the creeks for spawning trout, we pulled over and wandered down to the waters’ edge of Great Lake and boiled some water for a cuppa and deliberately sat there in the cold as the sun edged toward the horizon because it’s inactivity in these places that really chills the bones. Here I tried out the hoody, which had a good fit but still allowed a beanie but didn’t obscure the eyes or unduly interfere with head movement. I still didn’t manage to push the jacket to its limit and remained warm and toasty throughout. The only downside I could find with the jacket is one that other users have also decried, and that is the tiny zips. The zipper teeth are really delicate and fine and this means the zipper pull is likewise pretty well tiny. To complement the tiny zip pull there is a short thin knotted piece of string looped onto it. If you had to work these zips with gloved hands it may well be an exercise in futility. Even just a decent grippy toggle on the end of the string would be better (potentially one could retrofit these if it sufficiently disturbed you). In terms of the jacket’s limitations, I didn’t get to test it so far in any drizzle to see how the DWR would cope, but I’ll note here that the jacket is recommended by Arc’Teryx for cold, dry conditions. In my case, I just whack a 1.5 or 2 layer Gore-Tex shell over my down if there’s any rain about. They take forever to dry even in a clothes dryer so a hike would be somewhat jeopardised if the down got wet early. 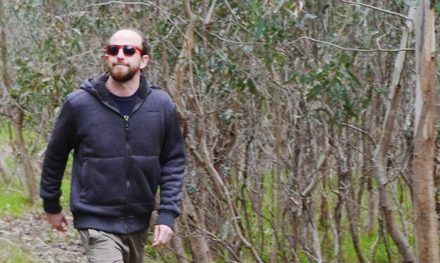 For Australian buyers, the Cerium LT Hoody is basically a top of the line down jacket and therefore is priced accordingly between $550-$580. 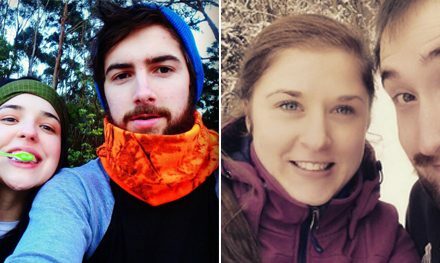 Arc’Teryx is renown for being a serious player in the premium outdoor adventure market and they’re playing in a whole different sandpit to the urban wear generic Chinese down puffer jacket manufacturers who are targeting Saturday morning soccer and netball mums with much of their gear. At first blush, using synthetic fill in a down jacket looks like cheating, but the use of Coreloft fill and down fill in strategic areas is really clever. The jacket is super warm and wind resistant and will definitely be in my pack for the cooler months of the year. It is lightweight, stuffs small, and the elasticated draw-string hems in the hood and waist are nice touches that add stability to all the beautiful trapped warm air next to your skin. DWR on the shell will help a bit if you get caught in drizzle but you wouldn’t want to be caught for long. For the cost, Arc’Teryx probably should have gone all out and used hydrophobic down. It has become much more readily available and really does work. The zips are too delicate for my liking from the perspective of robustness and ease of use with gloved (and potentially really cold hands). The little knotted string is tacky. The cost will mean a significant investment. 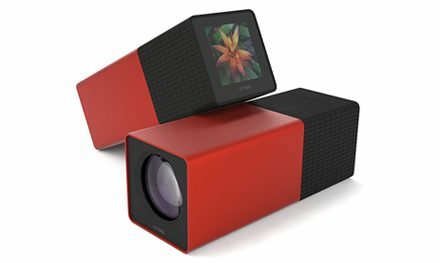 I have heard of blokes that have bought high-end gear by paying some on the card and some on cash so when their special other checks the statement they don’t get blown up. I didn’t tell you about this. The Arc’Teryx Cerium LT Hoody & Jacket is available online direct from Arc’Teryx. Aussies may be better shopping with Wild Earth (women here or men here). Disclaimer: Arc’Teryx provided a jacket for review. The Wild Earth links above are affiliate links, meaning The Bushwalking Blog receives a small portion of the purchase price, but you won’t pay an extra cent. None of this has any influence on the opinions presented in the above review. 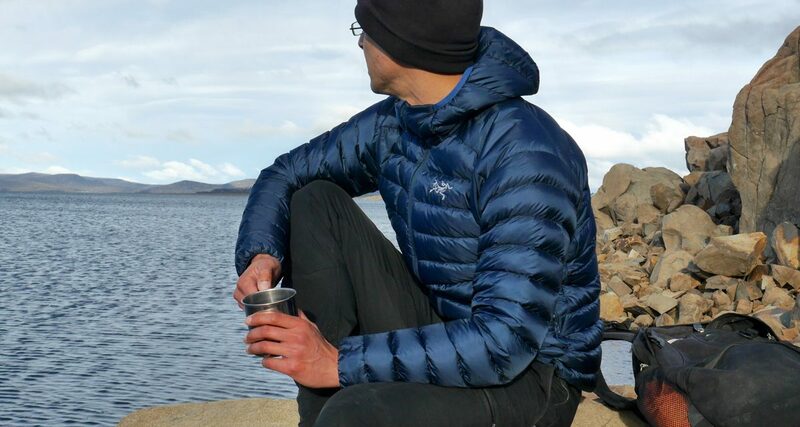 Have you tried the Arc’Teryx’s Cerium LT or any of their other insulated jackets? Got any questions or comments? Let us know by commenting below. 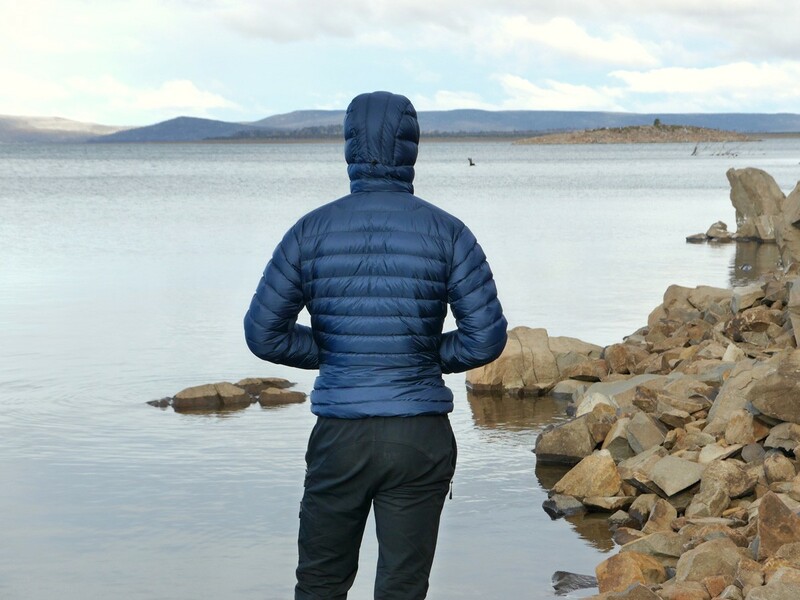 Summary The Cerium LT Hoody is a top rated jacket and my testing in one of the coldest places in Australia demonstrated its effectiveness. I’m looking forward to wearing this inside my bag next time I sleep in the snow because a cold head is usually a problem for me. The cost will make some baulk but for those who rate a product lifetime warranty, low weight, low volume, high insulation, high capability gear with quality workmanship, it will be seen as an investment. (Confession: I wore it to soccer last Friday night to watch the little one play).